Many years ago Emad could barely swim, let alone dive. 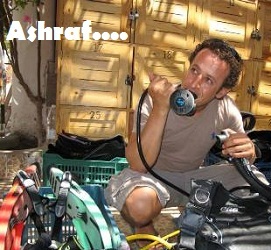 Then in 1999 he tried his first ever ‘Introductory Dive’ in Dahab and was hooked for life. From a non–swimmer he has become one of Octopus World's most experienced instructors and is respected across the dive community in Dahab. He is barely out of the water… diving every day, all year round. Emad speaks fluent English, Arabic and has recently refreshed his German, studying the language again and adding this to his multilingual skills. His diving specialties include Night, Drift, Nitrox and Deep Diving. 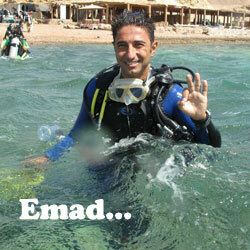 He loves to teach and have fun, with his unique personal touch, diving with Emad is guaranteed entertainment! Experience his underwater flying and dancing such as; ‘The Tango’, ‘Walk like an Egyptian’ and even ‘Moon Walking’ all mid-water of course! Often known as Mr. Hardworking Ashraf! He has been diving for over 10 years in Dahab and Sharm el Sheik, with over 7000 dives he certainly knows the South Sinai dive sites well! After an introduction dive in 1997 he was hooked and determined to become a Divemaster. He then took the step to becoming an instructor after working as a Divemaster for a few years. He hasn’t looked back since! Our Austrian instructor from Salzburg, aka Mister Easy! He speaks German (well, "Austrian German" ;-)) and English fluently. 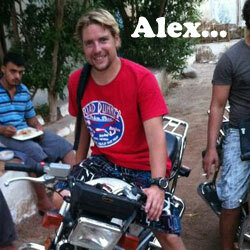 Alex is an experienced diver, great at giving clear explanations, his primary concern is your safety and enjoyment! He has brilliant ideas for unforgettable and awe inspiring dives. If you are lucky, he might take you on a full moon night dive to the Canyon! He's a fun loving person who is always up for a laugh. Alex is waiting for you to do a course with him! "Diving is fun!"